Given the recent Fed action and immediate market rally in certain QE3 favored assets, it should come as no surprise that old is back en vogue. The relationship between gold prices and gold miners should be quite clear – gold miners, which are levered to gold prices, should advance in excess of any move in the underlying price of gold. Those who watch the industry know that this hasn’t been the case. In the past five years, gold rewarded investors with 137% returns. Gold miners were slow to move on a change in gold price, moving only 20% in the same period. While the share prices alone don’t include dividends paid, since the yield on GDX is a paltry 0.27%, we’ll consider dividends to be negligible. The contrast is stark. 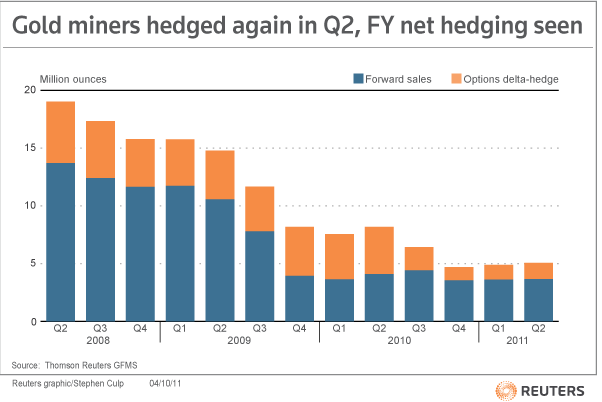 Gold miners are not usually direct levered bets on the price of gold because of their hedges. Gold companies often lock in prices for future production, which limits volatility, but puts a cap on the upside potential when gold prices rise higher. One can think of a gold miner like a future stream of gold, whereas a gold ETF backed by bullion and futures is simply gold in an investor’s hand. Going forward, gold mining stock investors have to ask themselves to what degree the industry will benefit from expiring hedges, less hedging activity, and higher gold prices. Barrick Gold (ABX), Goldcorp (GG), and Newmont Mining Corporation (NEM) all produce gold at relatively low cash prices of less than $700 per ounce. Naturally, they do not have the same operational leverage that you might find in high-cost gold miners. However, bigger players do come with sanity. The larger gold miners are less likely to engage in risky new ventures and have, as a whole, generated significant returns with their acquisitions. Additionally, the larger miners, which are heavily weighted in the GDX ETF, bring operational efficiencies that smaller acquirers cannot replicate. Barrick Gold recently tossed its CEO for a new leader, which the company hopes will help sort out rising production prices and institute policies that will give shareholders better leverage to gold prices. Some investors expect Barrick Gold will enact a dividend linked to gold prices similar to the dividend at Newmont Mining Corporation. Those who expect gold prices to remain stable or advance modesty from the $1700 price per ounce would be best to hold positions in the miners, which have operational leverage that has not yet played out in securities prices. As a share in a gold miner is a share of its future gold production, miners offer upside when hedges expire and the market corrects to reflect the reality that a position in a gold miner is a true levered bet on gold prices. Going forward, miners should revert to the mean, and the underlying leverage to the precious commodity should play itself out in faster appreciation for miners than the commodity. The question is, of course, a matter of when it will happen, not if it will happen. Barron’s reports that investors are getting into the pro-miner trade, buying miners on the belief that mining stocks can rally without a positive change in gold prices. Michael Purves, a Weeden & Co. strategist, suggests that the relationship between gold prices and the GDX ETF of miners should be 30:1. With gold at $1772 per ounce, GDX should trade for $59 per share. He cites a strong catalyst: increasing free cash flow at major gold producers as capital spending from years past winds down. Currently, GDX trades at a 7.2% discount to that valuation, meaning the better trade for bullish gold investors might just be in miners, not physical gold. With this theme in mind, investors could always consider a pairs trade, like the ones we’ve highlighted previously that have panned out nicely. Disclosure: No position in any of the ETFs or gold stocks mentioned here.